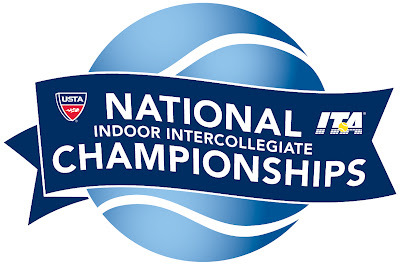 Once the regionals were completed earlier this month, most of the 32 places in the USTA/ITA Indoor Intercollegiate Championships were spoken for, with just the wild cards and at-large entries to be named. The names of those players were released today by the ITA, with the exception of host school Columbia's men's wild cards in singles and doubles. There are nine at-large players, due to Peter Kobelt and Matija Pecotic, who reached the quarterfinals at the All-Americans, also winning their regionals, and Emilio Gomez, another All-American quarterfinalist, withdrawing. All nine reached the final of their regionals, as required by the selection criteria. In the doubles, the two at-large berths went to Costin Paval/Dane Webb of Oklahoma and Moritz Buerchner/Norbert Nemcsek of North Florida. The one USTA wild card was given to Virginia's Alex Domijan/Harrison Richmond. The women have slightly different criteria. Although there are only two at-large berths in the women's doubles, there ended up being three teams who received entry that way, because All-American finalists Hanna Mar and Beatrice Capra are not playing. Mar won the regionals with Ester Goldfeld and so she will be in the draw. The three at-large teams, who must have reached their regional semifinals, are Robin Anderson/Pamela Montez of UCLA, Gabriella DeSimone/Zoe Scandalis of Southern Cal and Stephanie Nauta/Li Xi of Virginia. The USTA wild card went to Ashley Dai/Whitney Kay of North Carolina and the host wild card to Bianca Sanon/Tiana Takenaga of Columbia. For the complete list of participants for the tournament, which begins next Thursday in New York, see the ITA website. And a tip of the hat to the ITA and USTA staff, who have managed to keep all the information flowing despite the major inconveniences caused by Sandy. The draws and schedule for the Portland Invitational, which I'll be covering beginning Friday, have been released. This is the first multi-team event between college players and USTA juniors for women, and the format is the same as the men's Napa Valley event, with eight round robin groups that include one junior in each group. The eight winners will participate in a shootout Sunday afternoon with a Pro Circuit wild card on the line. A few days ago I published the list of players involved, which can be found here. I try to follow as many of the US juniors playing Futures as I can, but often overlook those who are playing outside of North America. 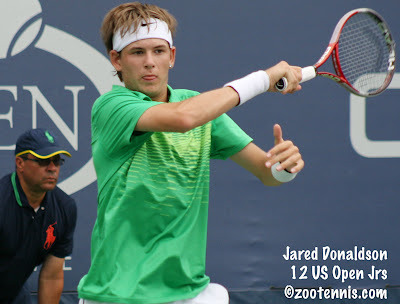 Last week Jared Donaldson, who trains in Argentina, played his first Futures tournament, in Venezuela, and had an impressive debut. Donaldson, who turned 16 earlier this month, qualified at the $15,000 hard court tournament, then beat top seed and ATP No. 309 Maximiliano Estevez of Argentina 3-6, 6-3, 6-4. Donaldson also won his second round match, against fellow teen Franz Sydow of the Netherlands, a wild card, before losing in the quarterfinals to former Baylor standout Roberto Maytin. This week, Donaldson is competing in another $15,000 Futures in Venezuela, where he again qualified (note that these Futures have qualifying draws of 16 or 32, not 128 as most Futures in the US have) and again won his first match. Donaldson beat 18-year-old Mateo Nicolas Martinez of Argentina, who is No. 10 in the current ITF Junior rankings, 7-6(5), 3-6, 7-6(2) in the opening round. Donaldson, who is from Rhode Island, has been training in Argentina for some time. For more on his "reverse commute," see the ITF Junior site, with Sandy Harwitt interviewing him during the Junior Davis Cup last month in Barcelona. Donaldson did not play singles in Barcelona, but it should be noted that both Noah Rubin and Stefan Kozlov, who did play singles, also have ATP points at ages 16 and 14. 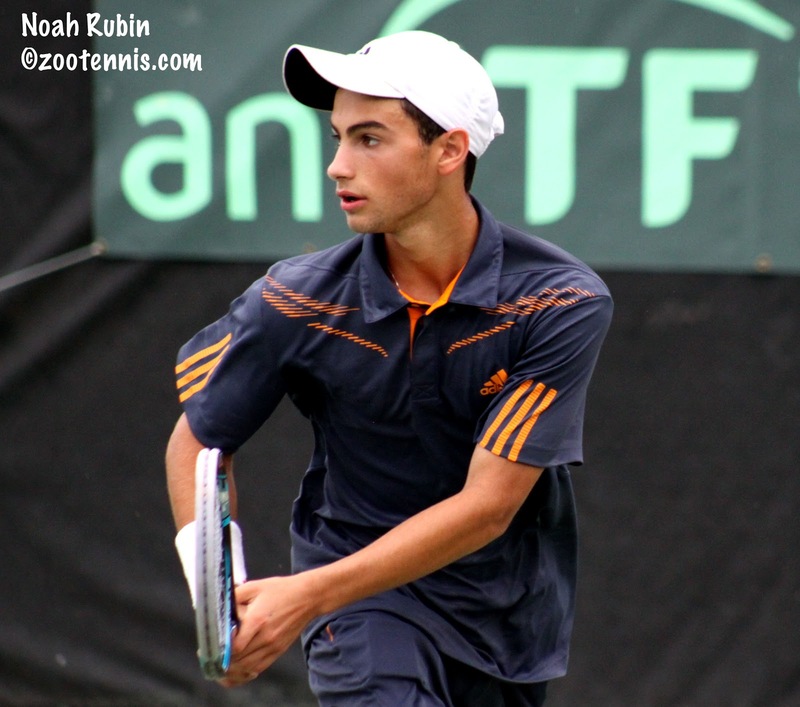 Rubin picked up a win today in the first round of the Pensacola Futures. Qualifying was completed today at the $50,000 Pro Circuit women's event in New Braunfels, Texas, as were several first round matches. Lauren Albanese, Jelena Pandzic, Taylor Townsend and Sanaz Marand are the four qualifiers. Lauren Davis had beaten Shelby Rogers three straight times, including in the final of September's Las Vegas $50,000, the last match Davis played before today. But Rogers got some revenge today in the first round, beating No. 2 seed Davis 6-3, 6-3. Italy's Camila Giorgi, the No. 1 seed, begins play on Wednesday against Ashley Weinhold. Wild cards were given to Yasmin Schnack, Vicky Duval and Rosalia Alda. 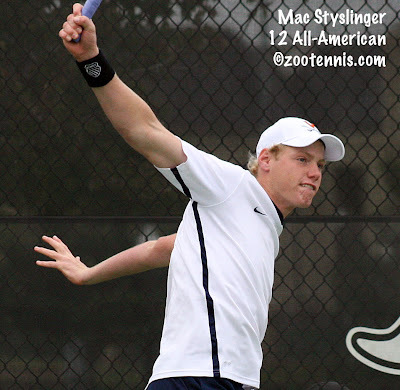 Styslinger, Quigley Qualify in Charlottesville 75K; Eddie Herr Acceptances; Lori McNeil Joins Zina Garrison Academy; Dual USTA Nationals? Today's third and final round of qualifying is complete at the $75,000 Challenger in Charlottesville, Va., with four players advancing to the main draw today, two of them unseeded. Virginia freshman Mac Styslinger, with an ATP ranking of 1905 (1 ATP point) continued his outstanding play this fall, defeating Jeff Dadamo 6-1, 1-6, 7-6(2). I watched the final set, via the USTA Pro Circuit free streaming, and it was every bit as close as the score indicates. Styslinger saved at least one break point serving at 4-4, then Dadamo saved a match point in the next game, after a double fault at 30-30. Styslinger had control of the point and a wide open court for his forehand, but he sent it just long. Dadamo held, but Styslinger didn't let his missed opportunity bother him, winning a quick service game to go up 6-5. His first serve seemed especially effective on the big points, while Dadamo was more erratic, and that proved to be the case in the tiebreaker. Styslinger hit a couple of impressive winners, but Dadamo made several forehand errors of the unforced variety to take most of the tension out of the ending. Styslinger will play former Old Dominion All-American Izak van der Merwe of South Africa in the first round, and he has already earned 5 ATP points for qualifying this week. 2012 NCAA finalist Eric Quigley of Kentucky made the main draw with a 6-4, 6-2 win over Great Britain's Ed Corrie, a former Texas Longhorn and will play No. 6 seed Bobby Reynolds. Taro Daniel of Japan defeated Devin Britton and Fritz Wolmarans of South Africa downed Darien King of Barbados to set up first round matches with Daniel Kosakowski and No. 3 seed Michael Russell respectively. The four main draw matches saw four college contemporaries advance to the second round, all in straight sets. Steve Johnson defeated Alex Bogdanovic of Great Britain, Bradley Klahn took out wild card Michael McClune, Rhyne Williams defeated No. 5 seed Ryan Sweeting and wild card Austin Krajicek beat Tsung-Hua Yang of Taiwan, a former ITF World Junior Champion. Johnson and Williams will meet in the second round, a rematch of the 2010 USTA/ITA Indoor final (won by Williams) and the 2011 NCAA singles championship (won by Johnson). The acceptances for the Eddie Herr 12s, 14s, and 16s divisions were posted today, and as expected with the reduced draw sizes in the 12s and 14s, there are long alternate lists. The competitors' list is available through a link on the IMG tournament page. The ITF 18s entries just closed last week, so that acceptance list is not yet available. For more on the changes this year at the Eddie Herr, see my article about it from late last month. A press release was circulated today announcing that Lori McNeil, who was a USTA Player Development coach from 2004-2012, has joined the Zina Garrison Academy in Houston as the Director of Tennis. At the Parenting Aces blog, Lisa Stone and Ross Greenstein of Scholarship for Athletes discuss having two 128 draws at the Nationals. As I wrote in a comment there, I think there may be logistical problems if there is more than one age group involved, and I really prefer the grand slam qualifying model, which would be a 128 draw with 16 qualifiers advancing to the main draw. However, this would not satisfy those who want all national participants to come through their sections and only through their sections. (Imagine the US Open with quotas per country and you have an idea why I am not a fan of this system). But whether you believe there's merit in the idea or not, do devote some time to thinking about how you would like the national tournaments to fill their draws, so you will be prepared for the Town Hall Listening meetings the USTA has promised. Top seeds Nick Kyrgios of Australia and Katerina Siniakova of the Czech Republic took the ITF Grade A Osaka Mayor's Cup singles titles today in Japan. Kyrgios, 17, defeated No. 2 seed and local favorite Kaichi Uchida 7-6(5), 7-6(4) to claim his first singles title at the Grade A level, although he does have two junior slam titles in doubles this year at Roland Garros and Wimbledon. He wasn't able to capture the doubles title in Osaka however, with Croatia's Borna Coric and Great Britain's Alexander Sendegeya, the No. 8 seeds, defeating Kyrgios and partner Omar Jasika of Australia, the No. 4 seeds, 3-6, 7-6(6), 10-4. Siniakova now holds two Grade A titles simultaneously, a rare feat in the juniors, with the Italian Open winner prevailing 6-4, 6-4 over No. 4 seed Karin Kennel of Switzerland in today's girls final. The 16-year-old was fortunate not to be affected by the virus that was circulating during the tournament, which left Indy de Vroome of the Netherlands unable to take the court against Siniakova for a much-anticipated quarterfinal contest. No. 7 seeds Harriet Dart and Katy Dunne of Great Britain received a walkover into the final of the doubles due to illness, losing to the No. 5 seeds Mami Adachi and Hikari Yamamoto of Japan 3-6, 7-5, 10-8. ITF junior circuit action resumes in the United States tomorrow, with the first round of the Grade 4 ITF in Atlanta. The final round of qualifying is today. The order of play can be found at the TennisLink site. In mentioned last night how many teenagers were seeking Pro Circuit titles today, and nearly all came through in today's finals. Seventeen-year-old Kyle Edmund of Great Britain defeated No. 3 seed Chase Buchanan 7-6(2), 2-6, 6-4 to win his first professional title at the $10,000 Birmingham, Ala. Futures, while Madison Keys, also 17, took the championship at the $50,000 tournament in Saguenay, Canada. Keys, the No. 7 seed, defeated No. 6 seed Eugenie Bouchard of Canada 6-4, 6-2 in Keys' first tournament since the US Open Women's qualifying back in August. It is her first tournament title on the Pro Circuit since she won a $10,000 in Cleveland more than two years ago. Ashleigh Barty, 16, of Australia won her fourth title on the Pro Circuit this year at the $25,000 event in Traralgon Australia, defeating Arina Rodionova of Russia 6-2, 6-3. French Open girls champion Annika Beck of Germany, 18, won the $75,000 ITF Women's Circuit event in her home country, defeating Eva Birnerova 6-3, 7-6(8) in today's final. Puerto Rico's Monica Puig, 19, won her second straight tournament in France, taking the title at the $100,000 Women's Circuit event in Poitiers with a 7-5, 1-6, 7-5 over Elena Vesnina of Russia. Eighteen-year-old Saisai Zheng of China took the $25,000 tournament in Taiwan, defeating 19-year-old Zarina Diyas of Kazakhstan in the final. And while she is not a teenager, it's worth noting that Alexa Glatch has won two straight $25,000 tournaments in Japan, beating Australia's Monique Adamczak in both finals. Sad news began circulating last night that 18-year-old Sean Karl of Nashville, one of the top players in the high school class of 2013, had been diagnosed with cancer. I have no additional details on his diagnosis, but there has been an open Facebook group set up called Pray for Sean Karl that is providing a way to show support for him and for his family. There is also a site for Sean at caringbridge.org. He verbally committed to the University of Tennessee this summer. There's no appropriate way to transition from that difficult news to a recap of tennis results today, so I'll just acknowledge that and plunge forward. The weekend has been good for Wimbledon junior champions, with current girls champion Eugenie Bouchard, 2011 girls champion Ashleigh Barty and 2011 boys champion Luke Saville all reaching ITF Pro Circuit finals. Bouchard, the No. 6 seed at the $50,000 ITF Women's Circuit event in Canada, cruised past top seed Melanie Oudin 6-2, 6-2 today and will play 17-year-old Madison Keys in Sunday's final. Keys, the No. 7 seed, defeated unseeded Alla Kudryavtseva of Russia 4-6, 6-3, 6-4 in the semifinals. Back in 2009, the 14-year-old Keys made a stunning WTA debut at Ponte Vedra Beach, Fla.. beating Kudryavtseva, then No. 81, in the first round. The 18-year-old Bouchard has continued to play major junior events in 2012, while Keys has not, and the two have not met since the quarterfinals of the 2009 Banana Bowl, which Keys won in three sets. Saville, as I mentioned in my post last week on teenagers in the ATP/WTA rankings, has had an excellent autumn (spring in Australia) and he has continued that this week, reaching the final of a $15,000 Futures in Australia as the No. 7 seed. He will face Ben Mitchell, the No. 4 seed, who reached the Wimbledon boys final in 2010, losing there to Hungary's Marton Fucsovics. 2011 girls champion Barty, who did not compete between this year's Wimbledon (where she received a main draw wild card) and this month, has reached the final of the $25,000 ITF Women's tournament in Australia. The 16-year-old, seeded No. 2, will play No. 7 seed Arina Rodionova of Russia in the final. French Open girls champion Annika Beck is likely to move into the Top 100 after reaching the final of the $75,000 ITF Women's Circuit event in Germany this week. The 18-year-old German will be the youngest player (by a month, over Laura Robson) in the WTA Top 100. Puerto Rico's Monica Puig, who just turned 19 a month ago, has had a fantastic two weeks in France. Last week she won the $50,000 ITF Women's Pro Circuit event there, and this week she has reached the final of a $100,000 tournament that features a very tough field. Unseeded, Puig defeated Virginie Razzano (who beat Serena Williams in the first round of the French Open this year), in the first round, then No. 5 seed Johanna Larsson, Stefanie Voegele and today, No. 4 seed Magdelena Rybarikova. Puig will play No. 2 seed and WTA No. 79 Elena Vesnina of Russia in Sunday's final. Puig has lost only one set, to Razzano, in her four wins. At the $10,000 Futures in Birmingham, Ala., Great Britain's Kyle Edmund avenged his first round Wimbledon Juniors loss to Mitchell Krueger today in the semifinals, defeating Krueger 2-6, 6-2, 6-3. The 17-year-old will play his first Futures final against No. 3 seed Chase Buchanan, who is in his fourth Futures final since he completed his eligibility at Ohio State in May. Buchanan beat top seed Daniel Garza of Mexico today 6-4, 7-5, and will be going for his second Futures title of the year Sunday. Krueger did pick up a win today in doubles. He and Bjorn Fratangelo, who were unseeded, beat top seeds Buchanan and Vahid Mirzadeh 6-2, 6-3 to take the doubles title. The qualifying is underway at the $75,000 Charlottesville Challenger, which is this year offering free admission throughout the tournament thanks to a new sponsor, and at the $10,000 Futures in Pensacola. See the USTA Pro Circuit page for the draws. The women are in New Braunfels Texas for a $50,000 tournament, with qualifying scheduled to begin on Sunday. For that draw and for the results of the semifinals today at the Florence $25,000 tournament, see the USTA Pro Circuit site. Just over two years ago, I covered the first fall competition that mixed USTA juniors with college players. My article about the 2010 Land Rover Napa Valley Classic described the challenges the NCAA rules create in organizing such a tournament, but two similar competitions are on the calendar for next weekend, in Portland, Ore. and Orlando, Fla. I did not attend the Napa tournament this year because I agreed to cover the first women's event in Portland next week. The tournament, which will be played indoors at the Tualatin Hills Tennis Center, is happening due to the efforts of the USTA and UCLA men's assistant Grant Chen, who began working on it over a year ago. Adidas is the presenting sponsor of the event, which will be set up in the same manner as the Napa tournament, with eight round robin groups, each containing one USTA junior and three college players. Once the round robin winners are determined, there will be a tiebreaker shootout with a Pro Circuit wild card on the line. Because I am covering the event beginning next Friday, I have more information on it regarding the participants and structure, etc., but there is another men's event going on simultaneously at the Disney ESPN Wide World of Sports in Orlando. The tennis complex there features ten clay courts, and there will also be eight USTA juniors competing, but from the USTA release, it doesn't sound as if the format, which features 11 schools, will be the same as Napa/Portland. There will be players from California, Central Florida, Columbia, Duke, Florida, Florida State, Georgia Tech, Kentucky, Penn State, Tulsa and Southern California. The juniors competing there are Deighton Baughman, Gage Brymer, George Goldhoff, Roy Lederman, Chase Perez-Blanco, Martin Redlicki, Ronnie Schneider and Ryan Smith. 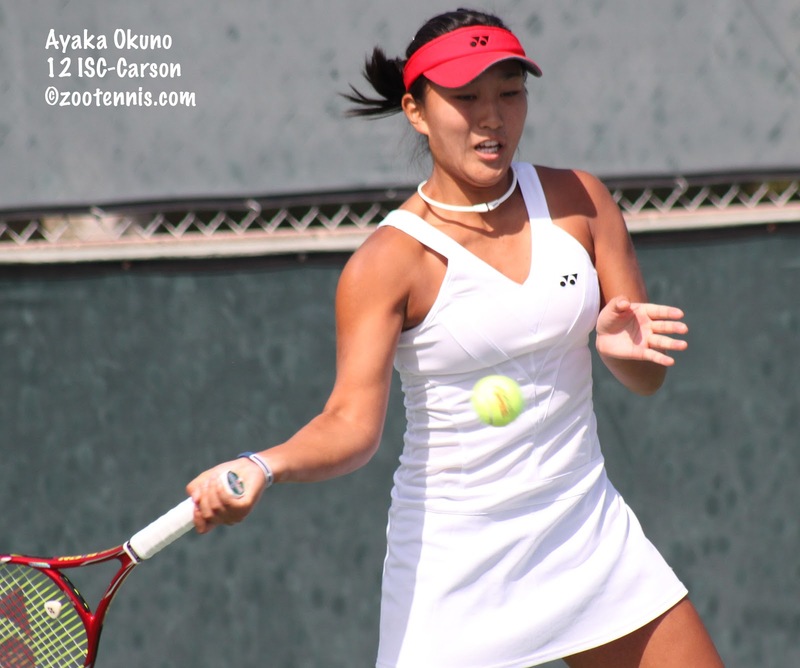 The USTA juniors for the Portland event are Gabby Andrews, Brooke Austin, Jennifer Brady, Caroline Doyle, Jessica Ho, Dasha Ivanova, Claire Liu and Kimberly Yee. Twelve of the 24 have ITA preseason rankings, so I'm looking forward to seeing some highly competitive matches. While in Tulsa, I spoke to Michigan's Evan King and Florida's Bob van Overbeek about their role leading the opposition to the changes proposed to the NCAA Division I tennis format. Both were modest about what they had done in creating a social media outcry against the changes, but were certain they had the backing of the vast majority of their fellow student-athletes. With that confidence, they provided a rallying point, which ended up attracting not just college tennis players, but coaches, fans and members of the tennis industry. For the complete story of what triggered their Facebook and Twitter campaign against the proposals, see my article at the Tennis Recruiting Network. Today in Japan, 14-year-old Michael Mmoh, the only American in the field, reached the quarterfinals of the ITF Grade A Osaka Mayor's Cup. Few Americans make the trip to Japan (often it isn't possible to play both it and the Pan American; this year it was), but the IMG Bollettieri Academy sometimes travels there with its students, and Mmoh has demonstrated he is competitive at the top ITF level. He qualified at the US Open and won a round there, won two rounds in Tulsa and now has reached the quarterfinals in his second Grade A. After Mmoh's 6-3, 6-4 win today over unseeded Omar Jasika of Australia, he will next face No. 2 seed and US Open semifinalist Kaichi Uchida of Japan. Mmoh has also reached the doubles semifinals, with he and Tommy Mylnikov of Canada, who are unseeded, beating top seeds Evan Hoyt of Great Britain and Nikola Milojevic of Serbia 6-1, 6-2 in the quarterfinals. For more on today's quarterfinal matches, see the ITF junior website. At the $10,000 men's Futures in Birmingham, Ala., five of the eight quarterfinalists are age 18 or under. Three 17-year-olds: Kyle Edmund and Luke Bambridge of Great Britain and US Open semifinalist Yoshito Nishioka of Japan are in the bottom half, along with 18-year-old Mitchell Krueger. All are unseeded. In the top half, there is one teenager, 18-year-old Lucas Pouille of France, who is the No. 5 seed and will play No. 3 seed Chase Buchanan in Friday's quarterfinal. Unseeded Dennis Nevolo, the former Illinois All-American, advanced with a 6-4, 6-1 win over Daniel Nguyen in one of the two former-collegian matchups, while Buchanan, who trailed recent UNC grad Joey Burkhardt 3-6, 1-3 with points to go down 1-4, won the final 11 games of the match for a 3-6, 6-3, 6-0 victory. Nevolo will play top seed Daniel Garza of Mexico in the quarterfinals. The doubles final will feature top seeds Buchanan and Vahid Mirzadeh against unseeded Krueger and Bjorn Fratangelo. At the $50,000 ITF Women's Circuit event in Canada, an intriguing second round match between Wimbledon girls champion Eugenie Bouchard and US Open girls champion Samantha Crawford turned out to be more one-sided than expected with Bouchard, the No. 6 seed, winning in 6-2, 6-2. Taylor Townsend got the biggest win of her career today in the first round of the $25,000 Pro Circuit event in Florence, SC, defeating top seed and WTA No. 113 Michelle Larcher de Brito of Portugal 6-2, 6-7(8), 6-4. Townsend, who qualified by beating Marianna Gould, Chalena Scholl and Denise Muresan, is playing in just her second Pro Circuit event of the year. Her first, a 6-1, 6-2 first round qualifying loss to Vicky Duval in Vancouver, was allegedly the result that triggered much of the controversy that emerged over her fitness at the US Open. Duval, by the way, qualified at the $50,000 ITF Women's Circuit event in Canada and won her first round match before falling to No. 7 seed Madison Keys. Townsend is unranked after not defending the semifinal points she won at the 2011 $50K in Carson (which was not on the 2012 schedule), or the US Open qualifying, where she scored her first big win in professional competition, defeating No. 122 Arantxa Parra Santonja of Spain in the first round before falling to Laura Robson in a third-set tiebreaker in the second round. Those results helped her reach 420 in the WTA rankings a year ago. The fact that Townsend didn't receive a wild card into Florence (those went to Brooke Austin, Lauren Embree, Jamie Loeb and Sanaz Marand) may not be related to her recent difficulties with the USTA, but it is a segue into Jeff Sackmann's post today about the abundance of wild cards available to young Americans compared to those from other countries. Sackmann, who writes the Heavy Topspin blog (and recently has written several posts with fascinating insight into what matters in a tiebreaker) looks at the number of wild cards given to men who were under 25 at the time. The current top 200 players received 748 wild cards before the age of 25. 139, or 18.6% of those, have gone to these seven, or 3.5% of players. Sackmann contrasts this with Grega Zemlja of Slovenia, now No. 50 in the world, who before he received his (much criticized) Wimbledon wild card, had gotten only one wild card--in a Challenger--in his career. He is now 26 years old. Sackmann explains why this inequity exists and even offers a few solutions. But the overriding question is whether it ultimately hurts the players who receive them. This is, I guess, the tennis equivalent of first world problems, but it bears considering. The complete post is here. Another different but perhaps related question is explored by Dan Coyle, The Talent Code author, in this post "The Power of Crumminess." Is there danger in state-of-the-art facilities? Can they lead to complacency, dulling motivation and competition? I guess all of us in tennis know the Serbian swimming pool story by now, so maybe there's something to it. Or maybe the facilities themselves are simply irrelevant. And, ultimately, wild cards are too. One of the pieces of information I picked up at the US Open last month and I guess never found a time or place to report involves Great Britain's Joshua Ward-Hibbert, who had signed a National Letter of Intent to attend Texas A&M. I heard that Ward-Hibbert has turned pro, and he will not be joining the Aggies. Below are the results of the 12 men's and 12 women's regional finals (with the exception of the men's Northwest, which had a rainout on Monday and is not yet finished). 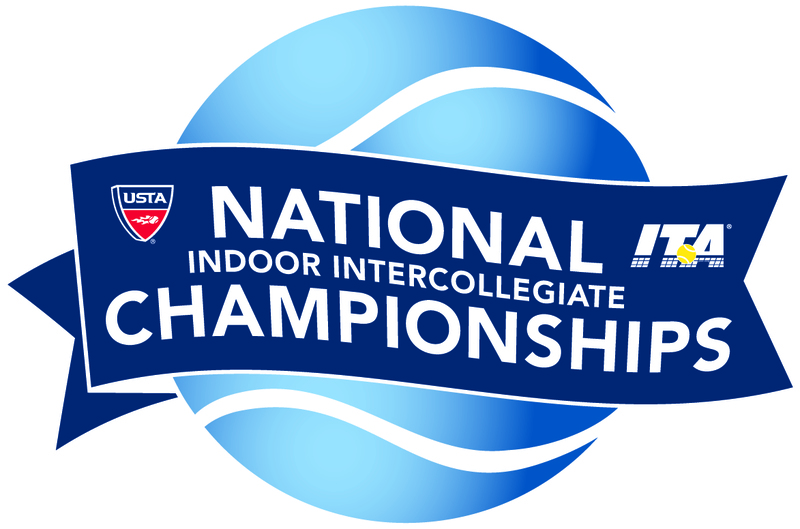 In addition to the prestige of winning a regional title those champions also receive entry into next month's USTA/ITA Indoor Intercollegiate Championships in New York. As it turns out, two of the All-American quarterfinalists, Pecotic and Kobelt, played in and won their regionals, so that will increase the at-large entries from 6 to 8. Several high profile players, including preseason No. 1 Henrique Cunha of Duke, did not qualify and will need to rely on a wild card to receive entry. Other No. 1 regional seeds who did not make the finals include Michigan's Evan King, Washington's Kyle McMorrow, Pepperdine's Finn Tearney, Florida's Bob van Overbeek, Oklahoma's Costin Paval, Baylor's Mate Zsiga and Kentucky's Anthony Rossi. In fact, so far, the only player who was in the 2011 men's field who has earned entry into this year's tournament is USC's Sarmiento. The women's selection criteria is different. For the women, there were no regional winners who had already qualified, so those numbers will not change. The complete selection details for women is also available at the same link. As you can see from the list below, many more top-seeded women reached the regional finals, with only five who did not: Nicole Gibbs (injury withdrawal) of Stanford, Emina Bektas of Michigan, Joelle Kissell of North Carolina State, Lucia Batta of UNLV and Nicole Bartnik of Columbia. For the doubles qualifiers, and links to the complete draws of all the regionals, see the ITA tournament page. By clicking on the name of the winners, you can read more about their regional final wins at their school's website. 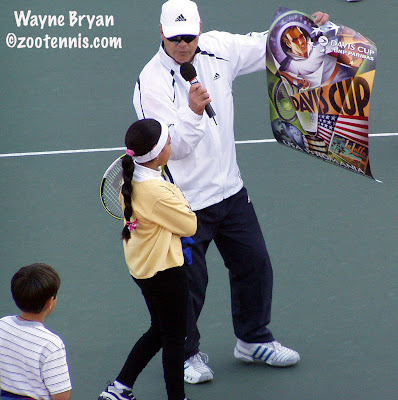 I quickly put up a post this morning announcing that the USTA has delayed all changes to the 2013 schedule and will hold a series of Town Hall Listening Meetings about the changes passed at the March 2012 USTA Annual Meeting. (The document detailing those changes can be found on this page at usta.com.) Please visit the TennisInsiders website, one of the many media outlets of Tennis Channel founder and tennis parent Steve Bellamy, to read the complete statement signed by those attending the meeting. Comments are encouraged. Fox News' Sean Hannity, another of the tennis parents who was at Sunday's meeting in Chicago, posted a few thoughts on the meeting at his blog. Coach and internet radio host JP Weber wishes there had been a tennis coach (thanks to Parenting Aces for the link), instead of so many affluent tennis parents in that meeting, but I honestly can't see anything but positives from this. Despite the stark reality that the changes were discussed and passed at the March meeting, the USTA has agreed to reopen the dialogue and delay the few changes that were scheduled for 2013, including reducing from 192 to 128 draws in the 16s and 18s for Clays and Nationals, and from 64 to 32 draws for regionals after July 1. I have said ad nauseum that I think these changes are a mistake (my original and still-valid comments on the proposals are here), but even if they are not substantially altered, I think the USTA is showing it has and will listen, which is the upshot of this USA Today followup story. You can be sure I will do all that I can to let people know when and where these Town Hall meetings will be. The Tennis on Campus initiative has proven to be an extremely popular intramural program, one that the USTA should take great pride in. The Fall Invitational was this past weekend in Hilton Head, SC, and Duke beat defending champion Virginia to win the gold division. Both teams have earned automatic qualification to the Nationals next April in Surprise, Arizona. For more on this tournament and Tennis on Campus, see this release on usta.com. Nick Kyrgios of Australia, the top seed at this week's ITF Grade A Osaka Mayor's Cup, has signed a professional representation contract with Global Tennis Connections. Ayaka Okuno of Japan, who is coached in Las Vegas by the LMFAO pop star Redfoo, won the ITF Grade 2 in Japan last week, her first ITF junior singles title. The No. 7 seed beat No. 8 seed Anhelina Kalinina of Ukraine 6-4, 7-6(3). Top seed Nikola Milojevic of Serbia won the boys title. The Athletic DNA junior tennis apparel company has begun a blog called "Sacrifice," which will feature junior players they sponsor. The first entry details the rare tumors that Connor Masella is fighting. This morning, after the Sunday meeting in Chicago, a statement from the USTA regarding the changes in the upcoming Junior Competition Schedule was released. "It was agreed there will be no changes to the National Junior Competition Schedule for 2013. In addition, it was agreed between now and mid-March there will be a series of transparent and inclusive "Town Hall Listening Meetings" at which industry representatives, parents, coaches, players, tournament directors, USTA representatives and other interested parties will discuss, and explore refinements to, the Junior Competition Schedule for 2014 and beyond." For more on the meeting, please go to this post at Tennis Insiders. Pro Circuit singles titles today went to Germany's Misha Zverev in the Mansfield Futures and Rebecca Marino in the Rock Hill, SC $25K. Zverev, the top seed, defeated Alex Kuznetsov of the US 3-6, 6-0, 6-3. Both Zverev, seed 1 and Kuznetsov, seeded 2, are rarely found in Futures draws, with most of their match play coming in Challengers and ATP qualifying. This Dallas Star-Telegram article, written prior to today's final, explains why they decided to play the $15,000 Futures tournament, the only men's tournament on the schedule this week in the US. Zverev and Kuznetsov were not able to follow their singles final with a doubles victory however. The No. 4 seeds lost to unseeded Vahid Mirzadeh (Florida State) and 2006 NCAA doubles champion Ryan Rowe (Illinois) 6-2, 6-7(5), 10-7, a team who had also defeated top seeds Devin Britton and Austin Krajicek in the semifinals. 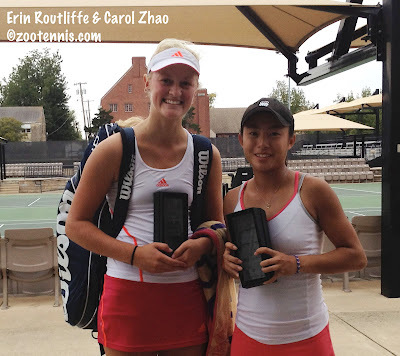 Another unseeded college pair of former collegians took the Rock Hill doubles title, with recent Tennessee graduate Natalie Pluskota and Arizona State junior Jacqueline Cako taking the title over another unseeded team from the US, Chi Chi Scholl and Connie Hsu (Penn) 6-2, 6-3. Marino, who was ranked as high as 38 in the world in 2011, took time away from the game from March through August of this year (for more on that see this article) and this is her first title in what is her fifth Pro Circuit event of the fall. A qualifier, Marino defeated fellow Canadian Sharon Fichman, the No. 8 seed, 3-6, 7-6(5), 6-2 in today's final. The women stay in South Carolina for the inaugural $25,000 tournament in Florence (for more on how that came about, see this article), with qualifying underway. 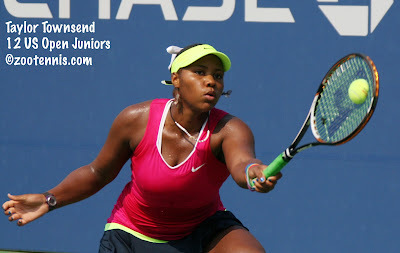 Taylor Townsend is playing in her first sanctioned competition since the US Open juniors and tomorrow will take on Chalena Scholl in the qualifying, a rematch of the 2011 Pan American Closed final, which Townsend won. The men are in Birmingham, Alabama for a $10,000 Futures, which has one of those daunting 128-player qualifying draws. There are still three more Pro Circuit challengers remaining in the US, starting with a $75K at Charlottesville at the end of this month, then the $50Ks in Knoxville and Champaign in November. 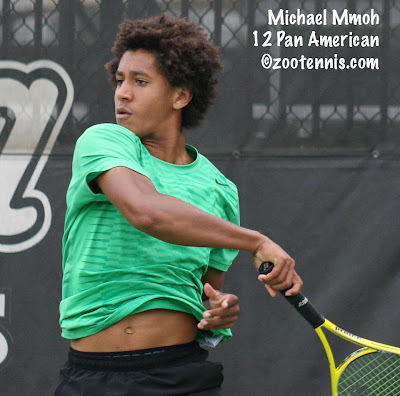 The ITF Grade A Osaka Mayors Cup begins Monday, with Michael Mmoh the sole US participant. Australia's Nick Kyrgios and Czech Republic's Katerina Siniakova are the top seeds. Ronnie Schneider decided to play high school tennis for Bloomington South in his senior year, and unsurprisingly won his third straight title. Alexander Waske, a 37-year-old from Germany who reached the Top 20 in doubles and the Top 100 in singles on the ATP tour, retired this year, and the former San Diego State star explains in this ATP website article how much his coaches in college meant to his professional success. He recalls how different recruiting was when he was a junior, before email and the internet made global communication much easier. I received a release earlier this month about a new service available, https://www.juniortennismatch.com/. It "allows parents to ﬁnd tennis partners for their juniors all over the country." For the complete release and further explanation, see the Parenting Aces blog. Chris Oddo, writing for USA Today, prepared this article about the USTA's 10-and-under-tennis initiative and the recent groundswell against the junior competition changes, talking to an impressive number of people, both inside and outside the USTA. I spoke with Chris at length by phone while I was in Tulsa, and a few of my comments made the published article. A meeting to discuss the changes, which I mentioned in this post on October 5, is scheduled for Sunday in Chicago, and once I hear anything, I will try to post it as soon as possible. I decided to look at the rankings today, a rare day when my attention wasn't pulled in another direction by this tournament or that result. Junior tennis doesn't have an off season when there's much time to reflect. The ITF junior calendar ends with the Orange Bowl, this year December 9th, and the new year begins before the old one actually ends with the first 2013 Grade A, the Abierto Juvenil Mexicano in Mexico, scheduled for Dec. 23-29 this year. With that packed schedule, it's hard to carve out a time to consider trends in the ITF world junior rankings, which many tennis fans and pundits believe to be pointless anyway. Yes, they say, Roger Federer may have been the ITF World Junior champion in 1998, but Denmark's Kristian Pless followed him the next year, and Pless's best slam showing was the 3rd round at the Australian Open in 2002, when he reached 65, the 31-year-old's highest ATP ranking. Victoria Azarenka, currently the WTA No. 1, finished 2005 as the ITF World Junior champion, but she and 2001 champion Svetlana Kuznetsova are the only two ITF World Junior girls champions in this century to have reached the semifinals of a grand slam (they have 3 slam titles between them). So rather than try to counter the objections to putting any stock in ITF Junior rankings, I'll just acknowledge them, and proceed. With two more Grade As to be played in 2012, next week's Osaka Mayors Cup in Japan, and the Orange Bowl, the US has the most boys in the Top 100 of the current ITF rankings, with ten, although none are currently in the Top 10. France and Italy are next with seven each. In the Top 50, the US and France are tied with five players. The youngest player in the Top 100, by more than a year, is 14-year-old Stefan Kozlov of the US, who is ranked 68. Two countries dominate the girls Top 100, with Russia and the US each having 12 players at that level, nearly a quarter of the total. The US has two Top 10 players: No. 1 Taylor Townsend and No. 5 Samantha Crawford; Russia has one, Elizaveta Kulichkova. If you prefer the Top 50 cutoff, the US has a clear lead there, with eight players compared to Russia's five. The youngest player in the Top 100 is No. 13 Ana Konjuh of Croatia, who will turn 15 in December. The lack of teenagers at the highest levels of the sport has been a trend for a while now, but there are a few players under 20 who are climbing quickly. One, who I mentioned in yesterday's post, is Croatia's Donna Vekic, the 16-year-old who is now ranked 108, and can still displace 18-year-old Laura Robson as the youngest woman in the Top 100 when the final rankings are issued on November 5th. But because she is just 16, Vekic is limited to 12 professional tournaments between her 16th and 17th birthdays (she'll be 17 next June), so she may want to save those precious dates--she's used four so far--rather than use them in the remaining few weeks of this year. Other teenagers besides Robson in the WTA Top 100 include Sloane Stephens, Lauren Davis, Timea Babos, Kristina Mladenovic and Garbine Muguruza, all of whom are 19. The ATP rankings are where the men are separated from the boys, with no teenagers currently in the Top 100 as of tomorrow, when No. 49 Bernard Tomic of Australia turns 20. The ATP rankings page sadly lacks the same sorting function available on the WTA rankings page, but fortunately Jeff Sackmann's Tennis Abstract has recently added a section of ranking by age, and I hope I've convinced him to include a Not-Yet-20 table. There was a chance that the year-end rankings wouldn't include a teenager in the ATP Top 300, but both Jiri Vesely, the 2011 ITF Junior World Champion from the Czech Republic, and former ITF Junior No. 1 Jason Kubler of Australia, both 19, have had good autumns and should finish in the 200s. Australian Open boys champion Luke Saville, another former ITF No. 1, is the youngest player in the Top 400, with the 18-year-old currently posting consistent results on the Australian Futures circuit. There's nothing in any of these numbers to suggest the Top 100 is going to get younger any time soon. But I also think it's a mistake to suggest the changes in the sport automatically preclude a "black swan", a player who is physically and mentally ready to compete at the top at a young age, as both Maria Sharapova and Rafael Nadal were. I received a brief statement from the USTA today regarding the announcement over the weekend that Andrea Collarini would return to representing Argentina after nearly three years playing under the US flag. "Andrea has asked that he be able to represent Argentina again. We will release him. We wish him all the best." I followed up with a question regarding any repayment of grants, etc. that Collarini received while training with the USTA and I was told he would not be required to provide any reimbursement, and the paperwork releasing him to Argentina is being sent to the ITF. The USTA/ITA Regionals are underway throughout the country, and already there has been a major surprise with No. 2 seed Dennis Novikov of UCLA, the Kalamazoo champion who won a round at the US Open in both singles and doubles, falling in the second round (his first match.) Novikov did not play the All-American due to an ankle injury he suffered in a Futures tournament this fall, and he will not be playing at the National Indoor Intercollegiate Championships next month either, unless he receives a wild card. Novikov has struggled since his Open success, winning two qualifying matches and and two main draw matches in three $10,000 Futures in California, suffering losses to Xavier Smith, Jason Jung and Daniel Nguyen. In today's match at the UC-Irvine regional, Novikov lost to USC sophomore Jonny Wang 6-4, 6-4. NCAA champion Nicole Gibbs of Stanford, who suffered an injury at the US Open, is now back playing, and is the top seed in the women's Northwest regional. [Update: Gibbs withdrew.] For the regional draws, see the ITA tournament page. I expect we've seen the last of Donna Vekic in the juniors. After her run to the WTA Tashkent final, and a recent semifinal at a $100,000 Challenger, she is now ranked 108 on the WTA computers. The 16-year-old Croatian, who trains in England with David Felgate, was the subject of the WTA's "Getting to Know" series, and also this post from Women's Tennis Blog that goes back, with photos, of her days in the Little Mo events. It's easy to overlook the work it takes to put on a tournament, from the facilities, to the logistics, to the organization and its leader, the tournament director. This The State feature, about Jorge Andrew, the Tennis Director for the Lexington (South Carolina) County Recreation and Aging Commission, traces his role in drawing many major events to the area, not previously known for its tennis culture. Andrew is the director of the ITF Grade 4 event in Lexington beginning November 5th. I've never been to that tournament, due to its date often conflicting with the ITA Indoor, but I've heard many good things about it. I'm closing the book on my annual fall trip to Tulsa with my recap of the ITF B1 Pan American Closed for the Tennis Recruiting Network. 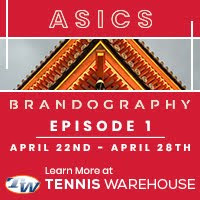 Below is the slideshow of the singles quarterfinalists and doubles semifinalists, and the YouTube videos of the two champions: Francoise Abanda and Noah Rubin. Videos of finalists Carol Zhao and Hugo Di Feo can be found by clicking on their names, or by visiting the tenniskalamazoo YouTube channel. My apologies for the sound on the videos, but it should give you a good idea of the wind velocity the players were contending with that day. 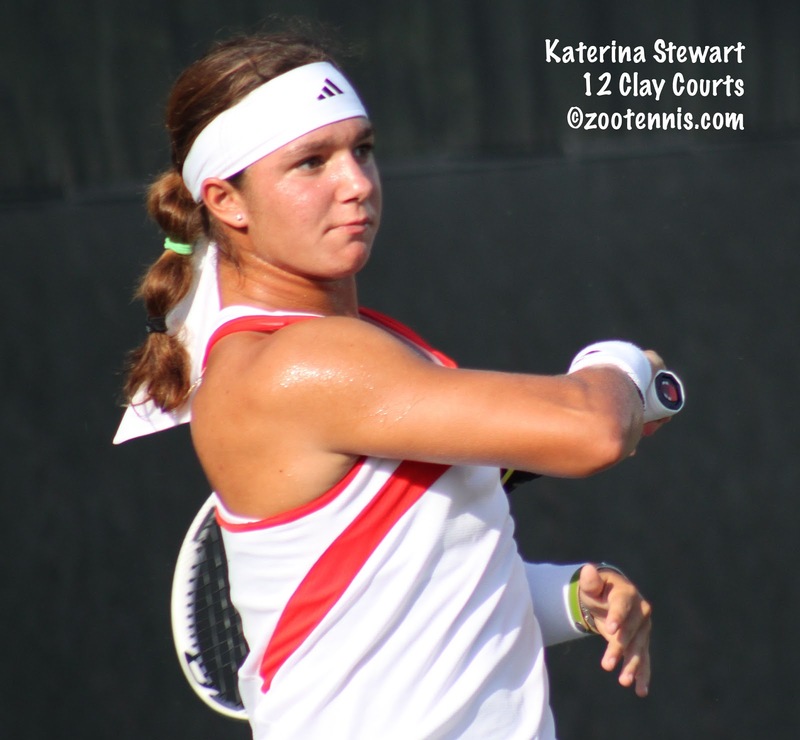 Fifteen-year-old Katerina Stewart, who turned pro this summer, got the best win of her career today at the $25,000 Pro Circuit event in Rock Hill, South Carolina. Stewart, a Miami resident, qualified, then defeated No. 3 seed Heidi El Tabakh of Canada, the WTA's No. 146, 6-3, 6-4 in their first round match today. Rock Hill is only Stewart's second Pro Circuit event; she reached the quarterfinals of her first, the $10,000 tournament in Amelia Island, last month. Pan American Closed finalist Carol Zhao, who had no day off between Saturday's singles and doubles finals in Tulsa and the start of qualifying in Rock Hill on Sunday, has now played singles matches ten days in a row, along with five doubles matches. Today Zhao defeated wild card Cory-Ann Avants, a local wild card, 6-3. 6-0. Zhao's doubles partne Erin Routliffe also qualified, and had she won today, they would have played each other, but Routliffe was beaten by No. 6 seed Chi Chi Scholl 6-2, 6-0. Grace Min and Allie Kiick are among the seven US women advancing to the second round. At the $15,000 Mansfield, Texas Futures, Texas A&M freshman Harrison Adams, a wild card, defeated No. 3 seed and ATP No. 236 Samuel Groth of Australia 7-6(5), 3-6, 7-5 in yesterday's first round. Adams is one of seven Americans to reach the second round, and none of them play each other Thursday. At the ATP tournament in Vienna, Austria, 19-year-old Dominic Thiem, the 2011 Eddie Herr and Orange Bowl champion, picked up his first ATP Top 100 win, defeating No. 51 Lukas Lacko of Slovakia 7-6(3), 6-3. Thiem, who was given a wild card into his home country's event, qualified and reached the quarterfinals of a Challenger last week in France, a result that boosted his ATP ranking to a career-high of 394. I received a press release today announcing the new Academia Sánchez-Casal in Naples, Florida, and it confused me for a moment because I knew they had already been in business in Naples a few years ago, and then were no longer there. Thanks to google, I was able to find this Gulf Coast Business Review article from June that explained what had happened. Academia Sánchez-Casal had operated a Naples branch from the Naples Bath & Tennis Club for three years until the academy ran into a disagreement with the club’s previous owner in 2010. Current seller PB-CRE Asset III LLC, an affiliate of The Private Bank, acquired the property in lieu of foreclosure from former owner Tennis Realty LLC in March. The press release touts the club as the "largest clay court facility in the US." I am certain it will be Har-Tru, not the red clay found at the famous Barcelona facility. If you missed the Mylan World Team Tennis Smash Hits fundraising exhibition last night, here is an account with photographs, courtesy of professional photographer and tennishorts.com principal Susan Mullane. Count me surprised that Christina McHale and Samantha Crawford beat Taylor Townsend and Martina Navratilova 5-0 in women's doubles. As promised, here is the slideshow and videos from the recently completed ITA Men's All-American Championships in Tulsa, OK. Note that except for the consolation finalists and the doubles semifinalists, all those shown have received entry into the draw of the USTA/ITA Indoor Intercollegiate Championships November 8-11, 2012 at the Billie Jean King USTA National Tennis Center in New York. Most of the remaining places in the draws will go to the winners of the regionals, the majority of which are taking place this weekend around the country. The list of the dates and host schools for the regionals can be found at the ITA website. Also, please visit the Tennis Recruiting Network's site regularly in the next several weeks as they have begin their Countdown to Signing Week. 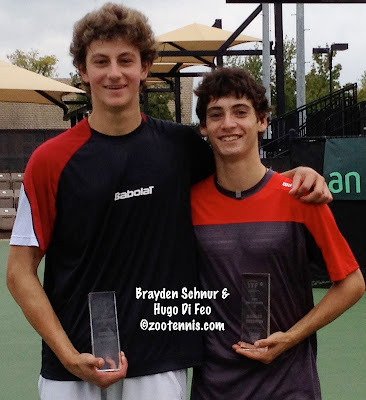 Today's commitment article is about 2011 Eddie Herr 16s finalist Andrew Schafer's decision to join the University of South Carolina Gamecocks. I am embarrassed to say that I didn't know this by now, but thanks to Lisa Stone at Parenting Aces, I learned last week that the NCAA proposal allowing juniors to earn $10,000 per year in prize money while still maintaining their amateur status was approved back in late April and is now in effect. In tennis, prior to full-time collegiate enrollment, an individual may accept up to $10,000 per calendar year in prize money based on his or her place finish or performance in open athletics events (events that are not invitation only). Such prize money may be provided only by the sponsor of an open event in which the individual participates. Once the individual has reached the $10,000 limit in a particular year, he or she may receive additional prize money on a per-event basis, provided such prize money does not exceed the individual's actual and necessary expenses for participation in the event. The calculation of actual and necessary expenses shall not include the expenses or fees of anyone other than the individual (e.g, coach's fees or expenses, parent's expenses). The ITA website also provides a complete list of the changes, some of which are clarifications regarding recruiting visits, calls, what and how much the institution can pay for. Another gray area has always been "sponsorship," but it appears that as long as the player isn't sponsored by an agent, a school, or a booster, the potential student-athlete can be provided with funds for travel expenses, etc. by a business or "angel." Anyone with an interest in college tennis should read this document, and I apologize for not posting it this spring, when these decisions were made. The small college champions who won the annual Super Bowl in Mobile, Alabama Sunday will play in New York next month as members of the elite 32-player draws at the USTA/ITA Indoor Intercollegiate Championships. Barbora Krtickova of Armstrong Atlantic will play in both the singles and doubles draws, the latter with Aleksandra Filipovski. The men's Super Bowl winner is Adrien Berkowicz of Tyler Junior College. The team of Georgi Rumenov and Daniel Reagan of Armstrong Atlantic won men's overall doubles title to earn their place in New York. Full draws from each of the eight divisions can be found at the ITA tournament page. 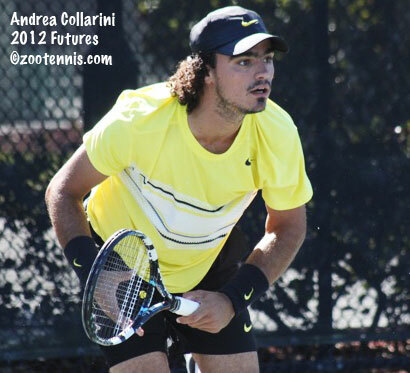 I first heard over the weekend from the Running Forehand blog that Andrea Collarini, who had played under the US flag for more than two years, including at 2010's US Open Junior Championships, will return to playing for Argentina, where he grew up and developed prior to receiving a USTA grant for training in Boca Raton. For more on Collarini's initial switch to the US, see this Newsday article from September of 2010. For another article (in Spanish) on his current decision, click here. The big annual Billie Jean King/Elton John Smash Hits fundraiser for AIDS charities is tomorrow night in Pittsburgh, with world junior No. 1 Taylor Townsend and US Open girls champion Samantha Crawford taking part. Andy Roddick, Andre Agassi, Stefanie Graf, Andy Roddick, Martina Navratilova and Christina McHale are among the pros participating in the event, which has raised over ten million dollars since 1993. The exhibition will feature a World Team Tennis format competition, with Anna Kournikova and former Pittsburgh Steeler Franco Harris serving as celebrity coaches. For more information on all participants, see this release. And if you can't attend, you can watch for free via live streaming from the WTT website. After, a bumpy day up in the air, I'm back in Kalamazoo after 11 days in Tulsa, with college and junior tennis absorbing all my focus during that time. The Pro Circuit doesn't pause while my attention is elsewhere and neither do the WTA and ATP tours. 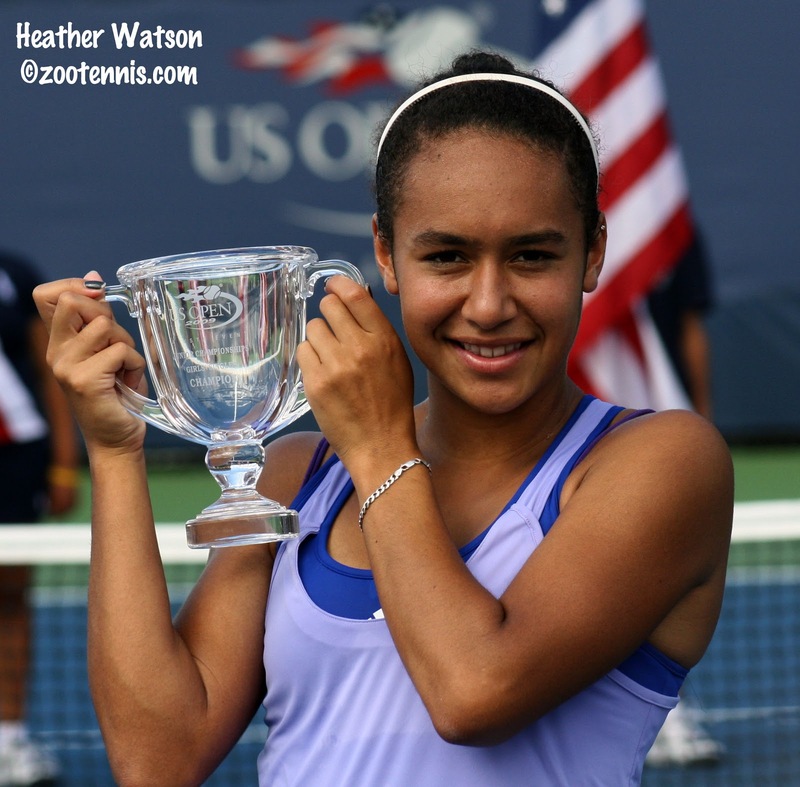 This weekend, two former US Open Junior champions, Heather Watson and Jack Sock, collected titles, and both saved match points in their respective finals, which went to third set tiebreakers. Great Britain's Watson, the 2009 US Open girls champion, won the WTA International level event in Osaka, Japan, defeating Taiwan's Kai-Chen Chang 7-5, 5-7, 7-6(4). Watson saved four match points (see this article from the WTA's website for more) to become the first British woman to win a WTA title since Sara Gomer in 1988. Neither Watson nor Chang were seeded in the tournament. Watson is now projected to become the British No. 1, just ahead of Laura Robson, when the new rankings are posted on Monday. The success of these two young players--Watson is 20 and Robson 18--has Great Britain buzzing, and The Independent focused on Watson and her family in this article, entitled "Heather Watson's Success Achieved Without Pushy Parents." 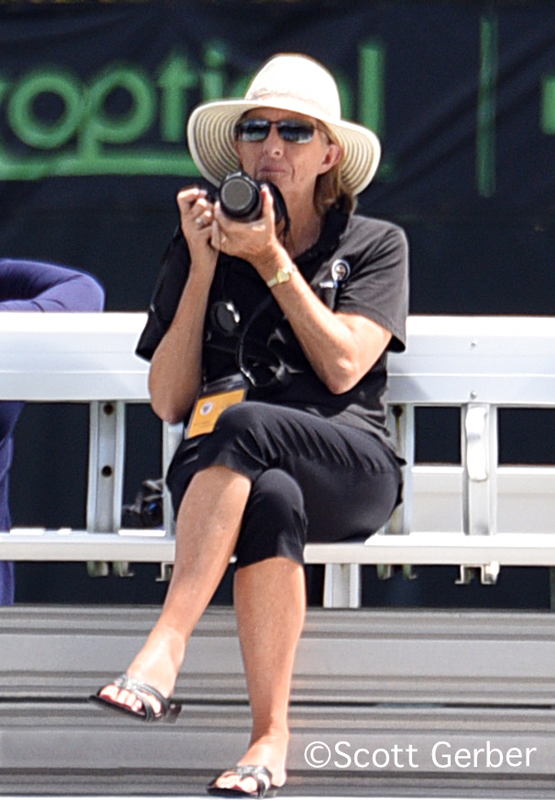 I have long admired Watson's mother Michelle, whom I see and talk with every year at the Eddie Herr, for her warmth, her common sense and her passion for the game, and I'm delighted her daughter's success belies the notion that tennis parents must be borderline obnoxious and "crazy." That generalization is not based on research or numbers, but on the visibility of those who do fit the unflattering description, so it's nice to read a story reminding us their are other models. 2010 boys US Open champion Jack Sock won his first Challenger title at the $100,000 Tiburon tournament today, defeating Misha Zverev of Germany 6-1, 1-6, 7-6(3). Sock, who had beaten NCAA champion Steve Johnson 6-4, 7-6(4) in the semifinals, saved a match point with Zverev serving at 6-5, 40-30 in the third set. As in the Osaka women's final, neither player was seeded. With the 100 points he gets for winning, Sock will move well inside the ATP Top 200, to a career high. No. 4 seeds Rik De Voest of South Africa and Chris Guccione of Australia defeated No. 2 seeds Jordan Kerr of Australia and Sweden's Andreas Siljestrom(the 2007 NCAA doubles champion while at Middle Tennessee State) 6-1, 6-4 to win the doubles title in Tiburon. This week on the Pro Circuit, Austin Krajicek won the singles and doubles titles at the $15,000 Futures tournament in Austin, Texas. 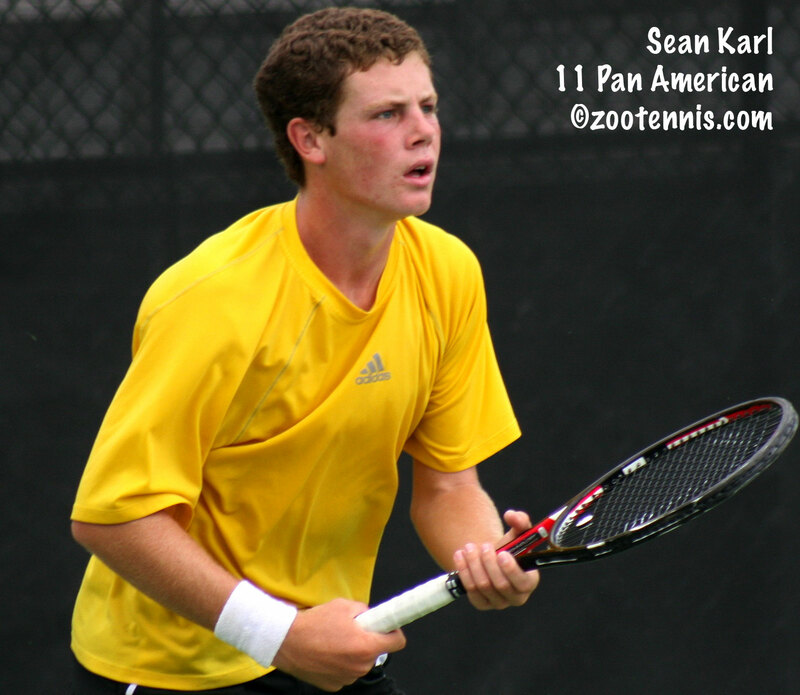 Seeded fifth, Krajicek, the 2008 Kalamazoo champion and 2011 NCAA doubles champion at Texas A&M, beat No. 4 seed Josh Milton of Great Britain 6-0, 6-1 in the singles final. It was the 22-year-old lefthander's second Futures title of the year in singles. Yesterday he and Devin Britton, the top seeds, won their fourth Futures doubles title of the year in Austin, beating No. 2 seeds Carsten Ball of Australia and Chase Buchanan 6-4, 7-5. It was Britton's tenth doubles title of the year, and Krajicek's fifth; Krajicek also has a Challenger title with former Baylor star John Peers this year. As in the Pan American Closed girls final, both finalists at the women's Troy, Alabama $25,000 tournament this week were Canadian, with No. 3 seed Stephanie Dubois defeating No. 7 seed Sharon Fichman 3-6, 6-4, 6-3 for the title. The doubles title went to the unseeded Russian pair of Angelina Gabueva and Arina Rodionova, who downed top seed Fichman and Marie-Eve Pelletier, also of Canada, 6-4, 6-4. This week the women are in Rock Hill, South Carolina for another $25,000 event, while the men are in Mansfield, Texas for another $15,000 Futures. For the women's qualifying draws, click here. For the men's qualifying draws, click here. There are no ITF junior tournaments in the US until the Atlanta Grade 4 the week of October 29th. Last year Noah Rubin's appearance in the ITF Grade B1 Pan American Closed final was something of a surprise, with the then 15-year-old wild card playing in only his second ITF tournament. This year he returned to Tulsa with the No. 1 seeding (and a soccer ball) and emerged with the title, defeating No. 4 seed Hugo Di Feo of Canada 6-2, 2-6, 6-2 in Saturday morning's boys final. Rubin, remembering the University of Tulsa's soccer field was located adjacent to the Michael D. Case Tennis Center, brought the ball to kick around between matches, but ended up using it as a calming influence during changeovers, spinning it on his index finger like a Globetrotter might do with a basketball. "It's just to distract me, so I don't think about tennis during the changeovers," said Rubin. "I knew we never had a ball to play with and I was always disappointed, so I brought it, then brought it on the court and started spinning it, and it helped distract me and it was good, so I kept doing it." Rubin had plenty of changeovers to practice his ball spinning, going to three sets in his final three matches. In the championship match, the 16-year-old New Yorker came out strong, adjusting to the gusty winds more quickly than Di Feo, taking a 4-0 lead before the 17-year-old Canadian got on the board. With a break in the first game of the second set, Rubin seemed on his way to a routine win, but Di Feo began to make his own adjustments to the conditions, which also included several brief stoppages of play to dry the lines after some sprinkles of rain. Di Feo broke Rubin four consecutive times in the second set, the final time at love to secure the second set. That pattern did not repeat itself in the third set, however, with Rubin getting an early break and holding with relative ease the rest of the way. In the final game, serving for the match at 5-2, Rubin took a 40-0 lead, but double faulted on his first match point. Match point No. 2 was indicative of many of the best points of the match, with a dozen or so ground strokes of all varieties until Di Feo had worked his way into a closing position at the net, only to have Rubin hit a perfect lob against the strong breeze to secure the point and the match. Di Feo, who lost in the first round of the tournament last year and was playing in his first Grade 1 final, said it was more the conditions than nerves that led to his slow start. He also gave Rubin credit for Rubin's ability to neutralize his own strong net game. "I know he's a really good baseliner, but he has really good passing shots," said Di Feo. "I'm pretty good at the net, but every time I was coming in, he would make a really good pass, so he did a very good job about that." Rubin was determined not to have any lapses once he got the early break in the third set. "I think I just focused a little more in the early points to get that first game in the third and focused really hard not to give it up," said Rubin, who is playing two Futures events later this month. "From then on, I felt loose to get the double break, and move on from there. He's a very good player, so I knew I had to be on my game the whole time, and that's what came out." Rubin saved three match points in his quarterfinal win over Roy Lederman, and that was one of the highlights of the tournament for him. "It's not even that I won it, it's just more experience," said Rubin, who lost in the final to Mitchell Krueger last year. "Saving match points I feel is more important than winning a tournament, because you know, at any point in time, you can come back and win a match. It's not about the points, and it's knowing that I can come back, no matter how many three sets I play in a tournament, I'll be okay for the finals." Top seed Carol Zhao had also come into the final battle-tested, winning three consecutive three-set matches, but unlike Rubin, she was unable to win the final one, dropping a 7-6(5), 4-6, 7-5 decision to No. 2 seed Francoise Abanda in the all-Canadian championship match. It was nearly three hours before a winner emerged, with each set, and nearly each game, decided by the slimmest of margins. Zhao served for the first set at 6-5, but didn't earn a set point in the game, with Zhao's unforced errors aiding Abanda's cause. In the tiebreaker, no more than a point separated the two, until Zhao tried a drop shot that barely reached the net to give Abanda two set points. Zhao forced an error from Abanda with a good backhand to save the first set point, but Abanda came up with a forehand angled sharply just outside the service box. It would have been a clean winner against most players, but Zhao got a racquet on it, although she wasn't able to direct her desperate forehand back over the net. Abanda took a 3-1 lead in the second set, but Zhao, who lost to Abanda in straight sets less than two months ago in the Grade 1 final in Canada, wasn't ready to concede. Zhao won four straight games to take a 5-3 lead, but again she couldn't get to set point. Abanda couldn't take advantage this time, however, and she was broken quickly thanks to her own unforced errors, leveling the match at a set apiece. There was no question that Abanda had all the momentum in the third set, breaking Zhao to start the set and getting a 4-1, two-break lead. But again, Zhao fought back, winning the next three games with some outstanding defense and also some aggressive swinging volleys. At 4-4, it was Zhao who had the momentum, but she couldn't keep it, with a flurry of unforced errors resulting in a break, giving Abanda the opportunity to serve for the match at 5-4. Just how frustrated Abanda had become with her play was evident after a double fault made it 15-30 and another error gave Zhao two break points. Usually the picture of composure and serenity on the court, the 15-year-old erupted, screaming loudly at herself in French. She lost the next point on a backhand error, and again the match was even. "It was so tight in the match and I'm not playing well," Abanda said, explaining her rare outburst. "I can't finish the match 5-4 and serving, and it's really frustrating." 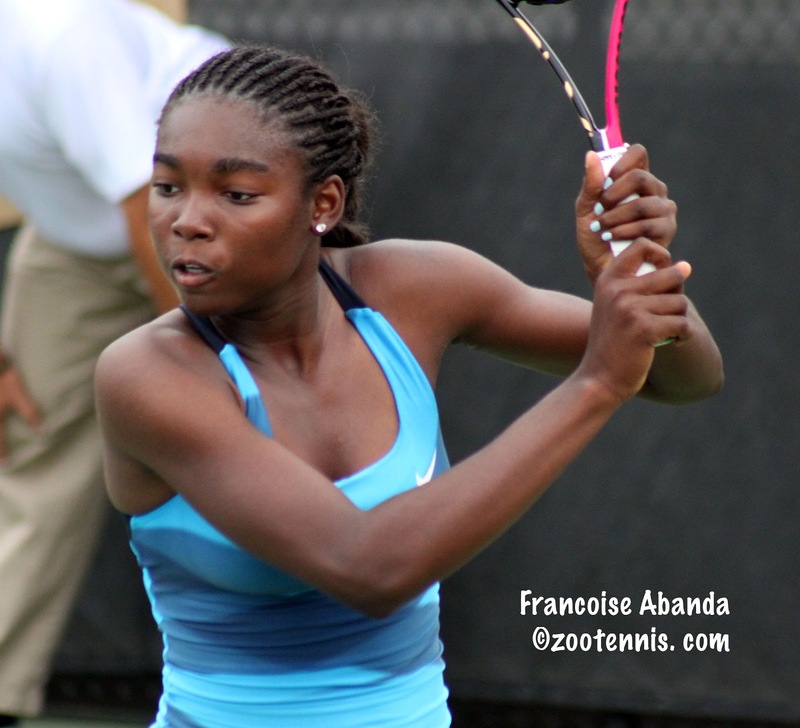 Zhao gave Abanda a second opportunity when she was broken at love, and this time Abanda converted. After Zhao had saved one match point, passing Abanda after a drop shot, Abanda had one match point left, and she put everything into a backhand down the line. It was untouchable, even by Zhao, and Abanda gave a shout of "allez" a second after she hit it. "I just said make it or break it," said Abanda of that final shot. "And I made it." For all the entertaining points, and there were many, including one early in the third set that had Zhao somehow returning a point-blank Abanda overhead at the net, with one great shot after another until Abanda finally won it with a perfect topspin lob, Abanda wasn't happy with her play. "I knew it was going to be a grind," Abanda said. "She's a really strong and solid player. But I thought I didn't play that well at all." Abanda had not played on Friday, the recipient of a walkover for the second time in the tournament, but she admitted to fatigue in the late stages of the match. "She was really in the match and I was really, really tired," said Abanda, "and I bet she was too a little bit, but she's really fit. I think we're both fit. I train with her and she's really fit, so I was expecting she wouldn't get tired. She's really solid, so I'm happy that I pulled it off." Zhao was most disappointed about the break at 4-4 in the third. "When you come back like that, you just want to keep the momentum going," said the 17-year-old from Ontario. "I think I could have done better on the break points and the pressure points, especially in the third set, but overall, I was pretty pleased with my performance." Zhao said she felt fresh enough in the final few games, and she demonstrated it by taking the court for the doubles final just a few minutes after the completion of the singles final. Due to take a flight out of Tulsa at 4 p.m., Zhao and partner Erin Routliffe, played the first set as if they would make their flight with hours to spare, taking the first set 6-1 over Charlotte Petrick of Canada and Denise Starr, the No. 6 seeds. At 2-1 in the second set, the rain started to fall again, and the match was moved indoors, where Petrick and Starr took a 4-1 lead. Routliffe and Zhao, the top seeds, won the next four games, but Routliffe was broken at 5-4. The next game went to a deciding point in the no-ad format, with Zhao poaching and putting away the volley to break Starr, and this time there would be no delays, with Zhao holding at love to post a 6-1, 7-5 victory. Zhao and Routliffe avoided the match tiebreaker played in lieu of a third set all week, winning all five of their matches in straight sets. "We're starting to learn more about each other on the court now," said Routliffe. "So it's working a lot better. We played well." "We've played together for a while now," said Zhao. "It was fun and we felt comfortable. This was definitely a good tournament for us." The Canadians swept the doubles titles, with Di Feo and partner Brayden Schnur taking the boys championship with a 6-3, 6-1 win over top seeds Martin Redlicki and Rubin. Although Di Feo and Schnur have played together for some time now, Schnur describes their first few times together as "rough." "At first, I used to live in Florida and we weren't really close friends, but when I started training in Montreal at the National Training Center, we grew closer and we're pretty good friends now," said Schnur. "You create a bond in doubles, and it helps us for sure. It takes time to become one." Di Feo was happy to end his tournament on a positive note. "It's always good to finish with a doubles win," said Di Feo. "Our goal was to win doubles, so when I stepped on the court I just wanted to win for him and for me. It was a good match today. We played really solid." Schnur assessed their performance in the finals as their best all week. "We started out rough, three sets in our first round, and just really weren't motivated for the doubles in the first round," said Schnur, who, like Di Feo, is 17 years old. "We were really pumped up today." "From the first point, we just made them play," said Di Feo. "We served pretty well, first volley, everything was perfect."